The strongest people make time to help others, even if they are struggling with their own personal demons. This saying is so true for the navigators sailing on the high seas. We ought to help people in distress. In fact, even if someone does not wish to, they won’t have a choice. 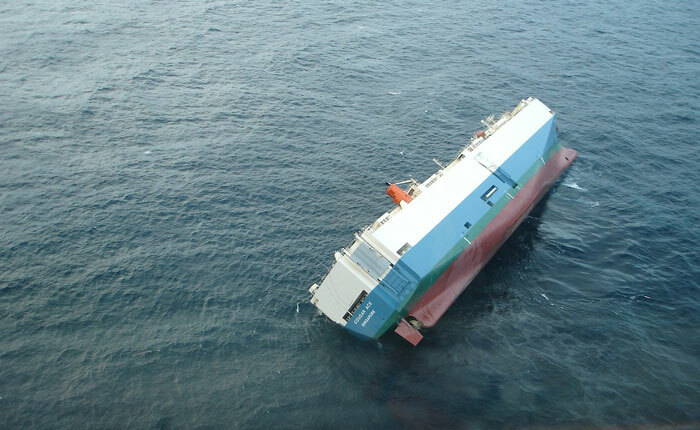 IMO requires every ship to help any nearby ship in distress. Not doing so will be the serious violation of international rules. GMDSS is the equipment on board that can let us know of any ship that may be in distress. A ship in distress can transmit its distress message to the ships and shore station thousands of mile away. When you receive a distress message from a ship that is 1000 NM away from its position, are you supposed to proceed for help? Irrespective of how helping heart you may possess, proceeding to help in this case will be illogical. So when must you proceed for help and when should you not? 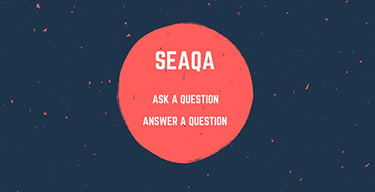 What do you need to do on receiving a distress message on board? Even if you are thousands of miles away from the ship in distress, is there any way you can be of some help? 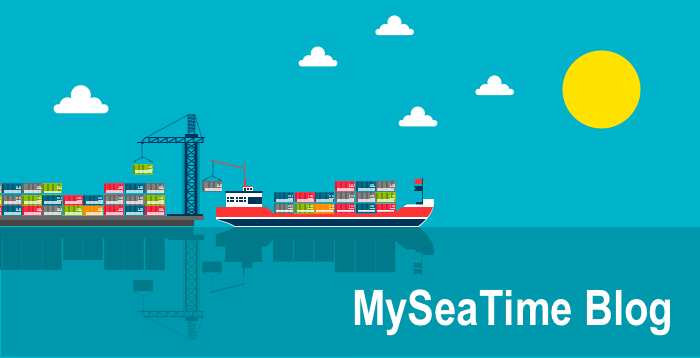 Knowing these answers will not only help the ships in distress but also help us in avoiding the violation of international regulations on providing help to the ships in distress. 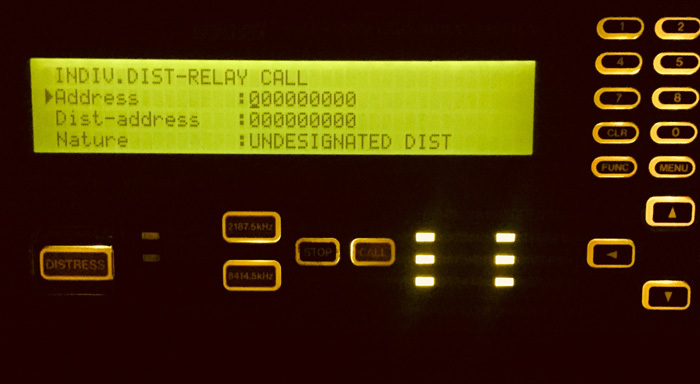 In this post, I will discuss the step by step procedures to follow on receiving a distress message on GMDSS equipments. Now before I discuss the actions on receiving a distress message on MF/HF, it is important to emphasize on maintaining these equipments in good order. The equipment should be able to receive and send distress messages when required. This guide can help in maintaining the MF/HF equipments in good order. MF/HF Equipment tests: how to do it and actions in case test fails ? 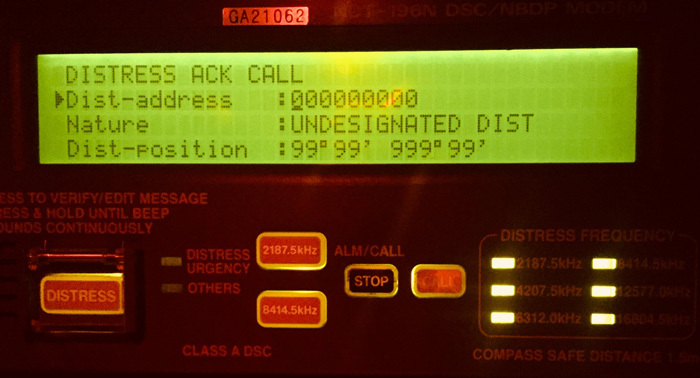 Coming back to receiving a distress message on MF/HF equipment. This is what a distress message received on MF/HF would look like. the frequency on which the distress message will be transmitted. In the sample distress alert above, this distress alert is received on 2187.5 KHz frequency. We must understand that DSC is used to alert and tell the nearby ships and shore station that “I am in distress”. The DSC alert may also have certain other information like the type of distress. But the time permits, the vessel in distress needs to broadcast the more specific nature of its distress. There are two ways this distress communication can go on. This brings us to two questions. How do we know if the ship in distress would broadcast its message on R/T or on NBDP? And how do we know on which frequency she would broadcast the message? Both the answers lie in the distress DSC alert received from the ship in distress. The information about R/T or NBDP is contained in the “Distress-Telecomm “. In some equipments, this is denoted as “Telecommand”. If the Distress-Telecomm is “J3E” or “F3E/G3E”, we need to switch to radiotelephony. If the Distress-Telecomm is “F1B”, we need to switch to NBDP. Now as in our sample DSC distress message, it is clear that we need to switch to radiotelephony and not NBDP but what frequency do we need to switch on? Here is the frequency table which is posted near the GMDSS station. 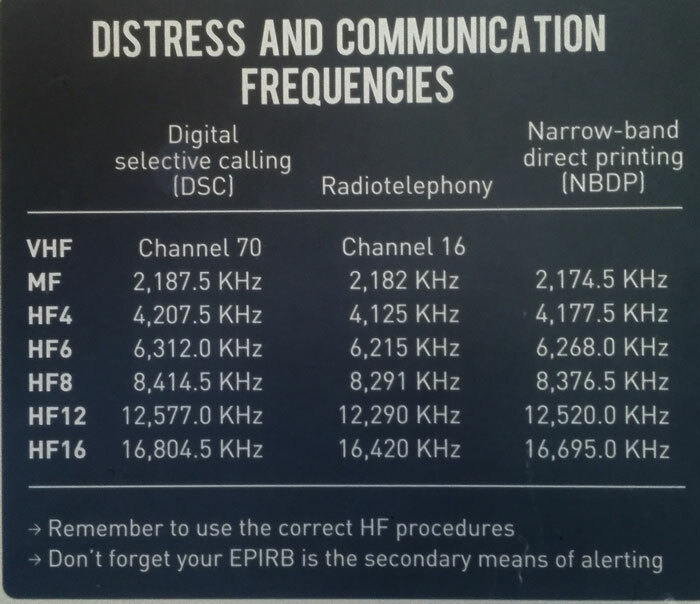 As the distress alert was received on the 2187.5 KHz frequency and as the distress message will be broadcasted on radiotelephony, we need to switch to the corresponding R/T frequency. From the table, we can see that this frequency is 2182 KHz. To switch to R/T on the MF/HF Station, check the present mode of the MF/HF equipment. On JRC, it is usually displayed on the screen. 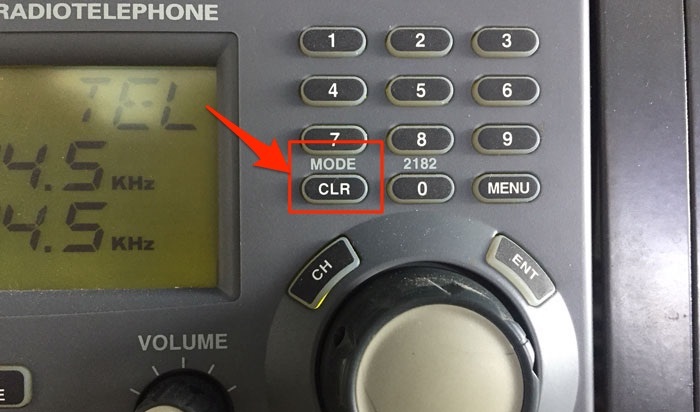 If it is not in the desired mode, change the mode by pressing the “Mode / CLR” button (on JRC). Once in the required mode, change the frequency by the number keys and press “ENT”. We have received the DSC distress alert and we have switched on to the corresponding frequency to listen to the distress message. But the question remains. If we need to proceed to help the ship in distress or not? But first, we need to understand few actions that the ship receiving distress message need to and need not do. When a distress message is sent by a ship in distress, it will continue to transmit the same message automatically in every 3.5 to 4.5 minutes. This transmission will only stop when someone acknowledges the distress call. The first lesson that every navigator need to understand is never to acknowledge a distress call from another ship. Because it will stop the transmission of distress message from the ship in distress. The distress message is only acknowledged by a coast station or by a ship when instructed by the coast station. If coasts station asks to acknowledge the distress alert, only then we can do it. Let us discuss how to acknowledge a distress alert. I will show it on JRC MF/HF. Press menu and go to option “Acknowledgement”. Press “Enter” and then choose “Distress acknowledgement”. Once all data has been entered, just press the Call button to send the distress acknowledgement to the ship in distress. We have to be clear on one thing. Apart from the ships in the immediate vicinity, If there is someone who has more resources to help a ship in distress, that would be the nearest coast station. It is important that a coast station receives the distress alert and coordinates the distress traffic. 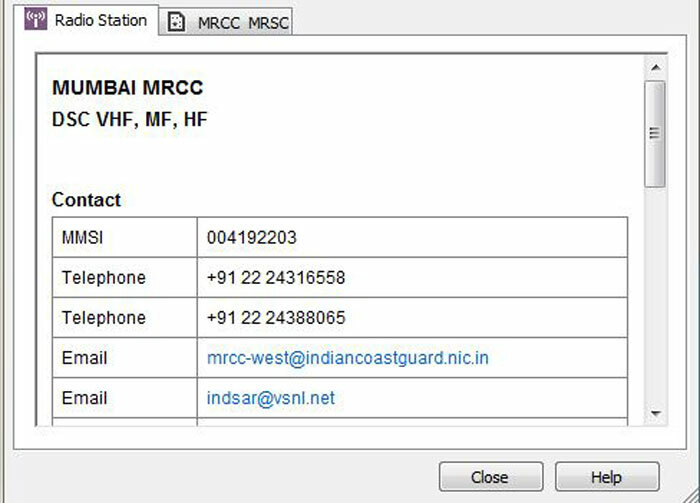 So if a distress alert is not received by the coast station, we need to transmit (relay) the distress alert to the nearest coast station. Let us see how to relay a distress alert on JRC equipment. Go to Menu and then to the Option 4, which is “Distress Relay Call”. 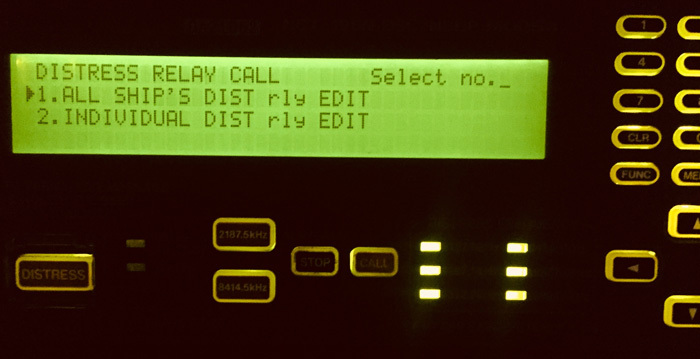 Under distress relay call option, choose “Individual DIST relay call”. In this option, we only send the distress relay to the coast station, the MMSI number of which we need to enter. All other information we have from the distress alert received. Finally, press “call” to send the distress relay to the coast station. 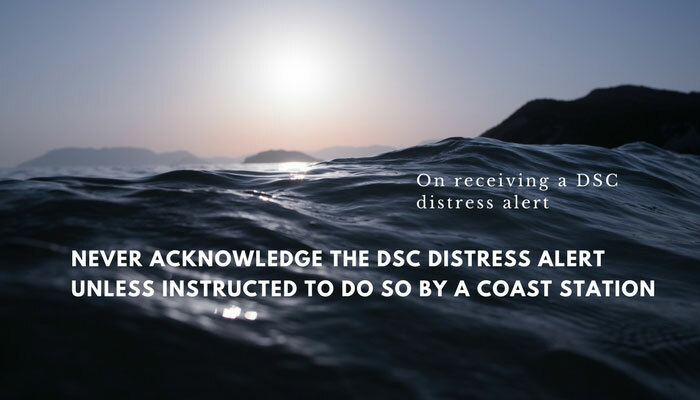 Well, the laid down procedures for actions on receiving a DSC distress alert are simple. This flow chart is supposed to be posted near the GMDSS station for quick reference. This flowchart gives the clear action which sometimes may not be clear on practical aspects. Let us touch on each of these points. We have already discussed if we need to switch on RTF or NBDP. We have also discussed which RTF or NBDP frequency we need to switch to. The question is why we need to switch on to these frequencies and listen for 5 minutes? What we are looking for is if any coast station has acknowledged the distress call or not. The DSC equipment is designed to transmit the DSC distress alert every 3.5 minutes to 4.5 minutes unless acknowledged. So when we wait for 5 minutes and if we receive the same DSC distress alert again, this would mean that coast station has not acknowledged the DSC distress alert. If we DO NOT receive the same DSC distress alert again within 5 minutes, it would mean that someone has acknowledged the distress alert. In this case, we can be at peace that someone is helping the ship in distress. If we receive the same distress message again within 5 minutes, it would mean that coast station has not acknowledged the distress alert. Let us discuss the two scenarios one by one. Let us consider that the distress alert has been acknowledged by the coast station. In this case, if the vessel is far away and is in no position to provide help, we can move on. If we are nearby and can provide help, we must contact the RCC by whatever means we can. 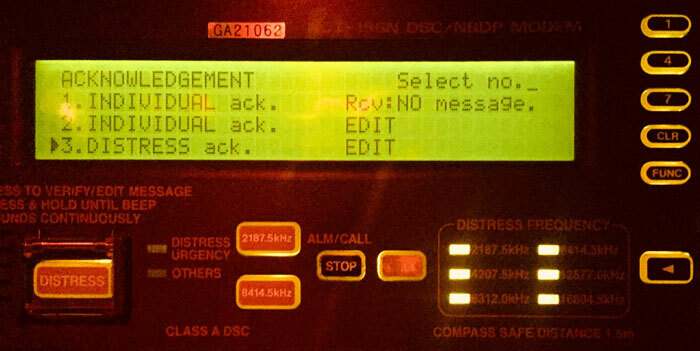 We just need to make the appropriate entry in the GMDSS log book about receiving this distress message. A common question that we hear is, how far or near we should be to proceed to help a ship in distress? Well, we will answer that question later in this blog. If the distress alert is not acknowledged by the coast station, it becomes our duty to ensure that coast station gets this distress alert. But wait, maybe coast station did get this distress alert and is communicating with the ship in distress. They might just have not acknowledged the distress call. We must know this by now by listening on the corresponding RT frequency or reading the communication on NBDP. If any communication is going on with the ship in distress then we know that coast station has got the distress alert. Again if we are in a position to help we get in touch with RCC to offer help. If not, we just make an entry in the GMDSS log book and continue our voyage. I think I have said it for enormous times in this post. We need to get the coast station into the picture. They are in the best position to coordinate the efforts to save a ship from distress. 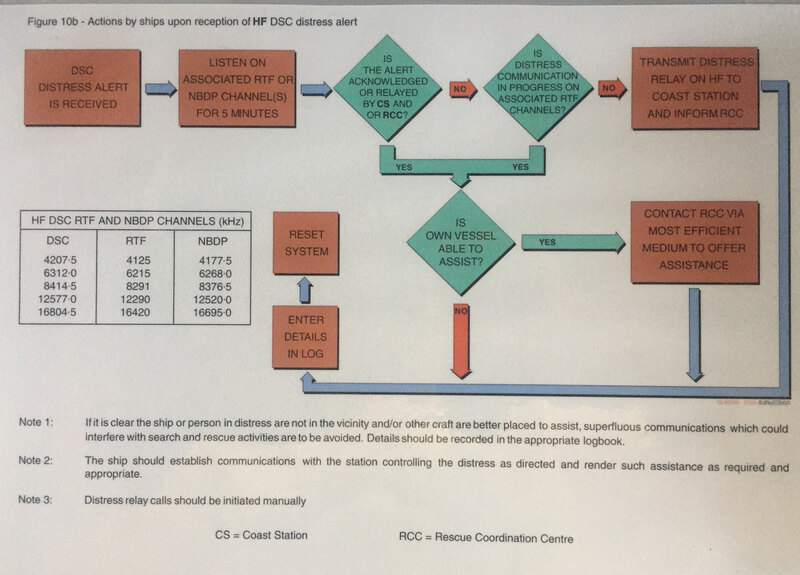 So what if a DSC distress alert that you received is not acknowledged by the coast station. There is no distress communication on the associated RT or NBDP frequency either. There can be many reasons why this can happen. Maybe you are closer to the ship in distress than the nearest coast station. Whatever the reason for coast station not receiving or not responding to the distress alert, we have to get this alert delivered to the coast station. We have to relay the distress message to the coast station. To relay the distress, we need to have the MMSI number of the coast station nearest to the ship in distress. 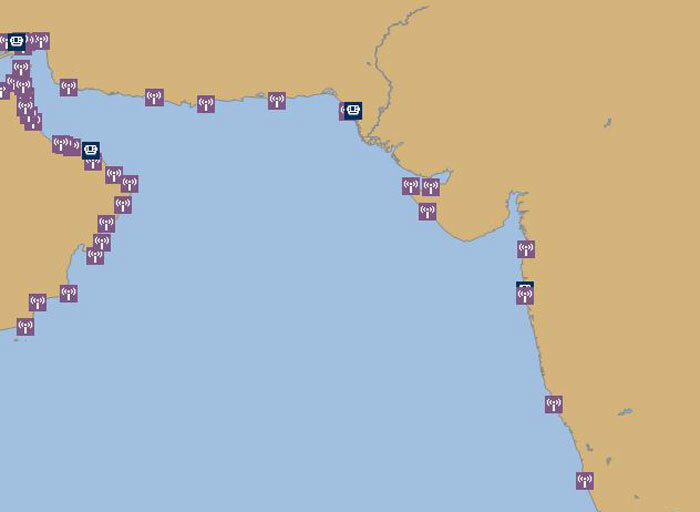 Let us say we received a distress alert from a ship in the Arabian Sea. Let us find the detail of the coast station we can send the distress relay to. Open the Digital list of Radio signals (or the ALRS book). 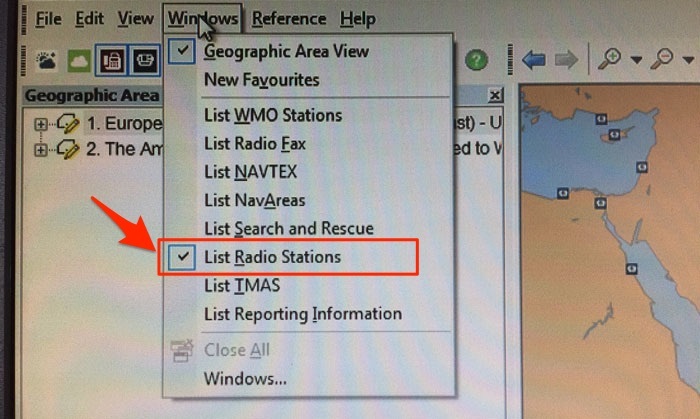 Go to “Windows” option and check if the “Radio stations” option is selected. In the map, it will show the icons for the radio stations in operation. Let us say we choose Mumbai radio station for sending the distress relay to. Click on the icon of Mumbai radio station and it will show its information as a pop-up. This has all the information including MMSI number. So far whatever actions we have discussed, I said that if the vessel is able to assist we need to get in touch with the RCC to offer assistance. But how do we know if we are in the position to help? A ship is in distress at a position about 100 nautical miles from our position. Shall we proceed to help? Frankly, I do not have a definite answer to this. Because it would depend upon so many factors. If this distress alert is in mid-Atlantic ocean, we must offer assistance by getting in touch with the RCC. If the weather, in this case, is not favourable, we then have to analyse the risk to our own ship. If the ship in distress is in Malacca strait, 100NM is a lot of distance. Coast station will be in better position to help that ship. In this case, we may continue to proceed on our voyage once coast station has acknowledged the distress call. The master of the ship has to analyse and consider all the factors to decide if the ship is able to assist the ship in distress. The ships are always on a tight schedule. Even one hour of delay is counted and scrutinized these days. But even under so much of commercial pressure, we must not forget our duty to help the ships in distress. In doing so, the first things we ought to ensure is that the “frequency table” and poster for “action on receiving a DSC distress alert” are posted near the GMDSS station. While responding to the DSC distress alert, we must first ensure that a coast station has received the distress alert. We can be sure of this if someone has acknowledged the distress alert and the alert is not repeating itself. Or if the coast station is communicating with the ship in distress on the corresponding frequency. If they haven’t, we must relay the distress to the nearest coast station. Finally, if the ship is able to assist we must inform the RCC about our ability to the help the ship in distress. Thank you very much, Captain Rajeev for sharing your knowledge and experience, I am always waiting for your articles. I was waiting for the new article long time. I had read all of your posts and it’s very useful and easy to get it. Thanks a lot! Dear capt., We are in Navarea I, noticed that Navtex msgs are pouring out while Sat-C barely print any Navwarn except one rig list and one summary of in force Navwarn. Why? Is Navtex replacing Sat-C as primary Navwarn promugator in area I? Thanks. Another question, i don't if you have worked on bridge with all FURUNO equipment, the FURUNO doppler log DS60 frequently gives "alarm 011", i have looked into the manual, searched online, didn't find anything useful to explain what is the alarm and how to solve it, do you have any insights please? Capt. is EM log and doppler log the same equipment? or obsolutely two very different item? Both measures speed through water.. only the principle of operation is different. EM log works on electro magnetic rays and Doppler log works on Doppler effect..
What will be the procedure, if a ship call us on VHF by name and told us that they have a missing person onboard and suspect it as possible manoverboard. Request us to assist them in search and rescue. Can we consider it as Distress call? as per Gmdss. ..in no case vessel shall send the distress relay on rept of dsc distress alert on VHF and MF. your distress rcvd on 2187.5 fq...pls let me know your action on rcvg alert on MF? what you have explained is for HF. Thank you so much sir for the complete and details instructions I have been looking for... Would love to see more such writings in future. Dear Captain Rajeev Jassal, after reading numerous blogs of yours, I would like to extend my thanks to you for taking the time to write in such a clear, helpful, and interesting manner. I am currently studying for my Master Orals and I am finding that although I am aware of much of the information, your blogs have been consistently helpful in arranging my answers in a clear, concise, and professional manner. Please let me know which all stations reply to our NBDP calls for testing my equipment and on which frequencies.Highly appreciate. Now it's clearer as never before.